When The Witcher III developer CD Projekt Red first showed its next game Cyberpunk 2077 at E3 2018, fans were surprised to learn the game would take place from a first-person perspective. It’s a jarring move from the third-person action of the Witcher games, but according to the game’s producer, it all came down to making the world more immersive. Speaking to GameSpot at Gamescom in Germany, producer Richard Borzymowski said the decision to move to first-person was “narrative-based,” rather than one made to challenge the studio to create something unfamiliar. 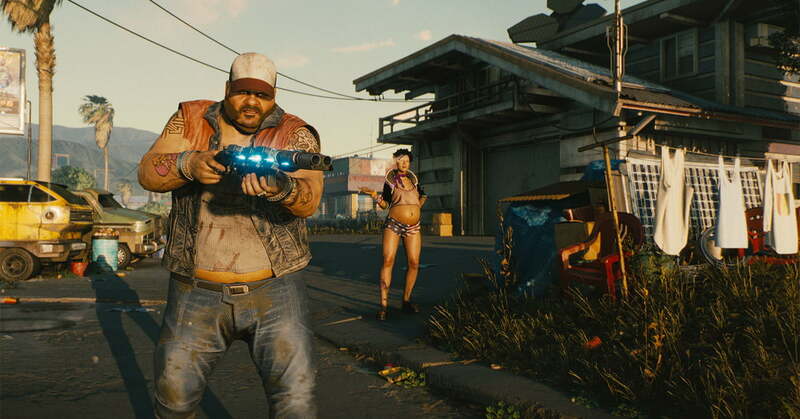 Borzymowski added that the first-person perspective is also a better choice for Cyberpunk 2077‘s combat. Unlike the melee-focused battles of the Witcher games, Cyberpunk 2077 is focused on gunplay to fit its time period. One notable fan of the perspective is Mike Pondsmith, the creator of the tabletop game Cyberpunk 2020, on which Cyberpunk 2077 is based. To coincide with Gamescom, CD Projekt Red also released several new screenshots from the game, giving us a look at a few of the enemies you’ll encounter. In classic cyberpunk style, they’re equipped with a variety of bionic modifications that make them scarier than your typical goons, including a glowing mask that looks like an upgraded version of Splinter Cell’s goggles. Two other screenshots show a larger man with hexagonal cracks across his cheeks, perhaps indicating that he’s actually a machine — the man bun on his head suggests that fashion trends haven’t gotten any better in 2077, however. Cyberpunk 2077 was one of our favorite games from E3 in June. From the cybernetic enhancements on display to the environments and the flexibility of the combat, we think CD Projekt Red is onto something very special. The game doesn’t have a release date yet and is planned for launch on PlayStation 4, Xbox One, and PC, but we would be very surprised if it didn’t also launch on next-generation systems. With the level of detail and fidelity we’ve seen thus far, it could be the perfect game to convince prospective customers to make the jump to the next PlayStation or Xbox console.